3D Printing | What Does This Button Do? 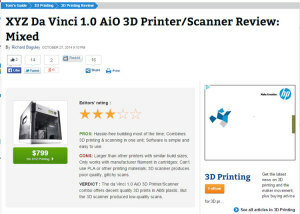 I reviewed the XYZ Printing da Vinci 1.0 AiO, an interesting 3D printer and 3D scanner combination. However, the scanning portion of the product proved to be rather disappointing, producing low quality scans. The da Vinci 1.0 AiO is a frustrating combination of a good printer and a poor 3D scanner. It outputs decent quality 3D prints of most objects, but struggles with smaller details or more complex objects. The scanner does an acceptable job with simple objects, but struggles to capture small details and has a lot of glitches. That makes the da Vinci 1.0 AiO a weak combination device.